My past two weeks had been hectic, travelling here n there, following the ceramahs by PR leaders, attending PACA trainings & later helped training other volunteers, contributed my part as CA for PR camp, & lastly had show my dissatisfaction on the GE13 result by joining the 508 assembly. May05 night must be a heart-breaking one for those who have each contribute their part in hope for a change for our beloved country. It was initially promising when the unofficial results favors PR. However, we all know now how BN has at last turned out to be the winner, leaving conscious people in deep shock & disbelief. Anyway, let's keep the politic part short as I believe many have been tired after a month of following the UBAH movement & news on the social media. However, please do exercise caution when browsing through related news on fb, inevitably there will be some bad apples spreading falsified information in hope to attract the wrong kind of attention. To the market, its always good news that incumbent party continue to rule, leaving less space for hiccups & uncertainties in financial & corporate activities. We must be able to detach from the bitter citizen role, keeping a clear mind as an investor/trader to hunt for opportunities, as the market rally to the new-found strength after shrugging off GE uncertainties. Sidelined investors hoarding cash may start to buy again following the massive post-GE spike on the local KLCI, leaving the index well-above its decade-old resistance, signalling another potential round of medium-to-long term bull market. Nonetheless, the May06 thrust has to proof solid by holding above the 1,720-40 breakout support level, or at least above the 1,700 psychological level, for the potential of another long-term bull run to realized. 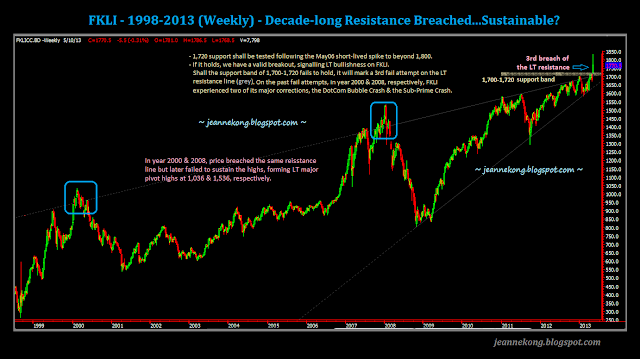 A clearer view on the May06 breakout above the decade-long resistance. Not that previous two breakouts from the same resistance line failed & reversed back down to become among the major crashes in FKLI history, the year 2000 internet bubble, followed by the 2008 sub-prime crisis. Hence, reiterating the significance of 1,700 & 1,720-40 support band for the current breakout to remain valid. CPO went on the opposite direction the past week, continuing its downtrend to again retest the 2,230 support, for the fourth time in the past seven months. 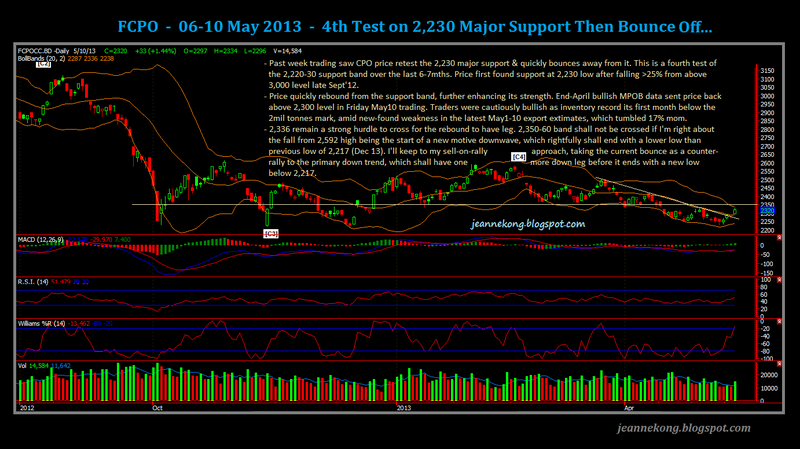 It then swiftly rebounded from the major support band, which has again proved its strength in supporting price, sent CPO price up to close the week at 2,320, comfortably above the 2,300 mark. Price may have break above the MT downtrend line, respected by price since the fall started back in Feb from 2,592 high. However, it has yet to overcome the 2,336 & 2,350-60 resistance levels, which I see as crucial levels which defines whether the current bounce remain a counter-rally in the dominant downtrend, or has it turned into a serious reversal given that the major support has proven solid after several successful tests. I'm keeping to the counter-rally theory until I'm proven wrong. Still waiting for a lower low than 2,217 (previous significant low recorded on Dec 13) to complete the current downtrend from 2,592 latest peak. On another note, end-April MPOB data was surprisingly bullish, recording a first end-stock below 2mil tonnes amid rising production & slowing demand (very questionable indeed....@_@''). Anyway, May1-10 export estimates showing a 17% tumble m-o-m spoiled the party mood a little, as cautious bullish bets were observed where buyers refrained from pushing price up further beyond the 2,336 resistance, despite the very bullish inventory report. 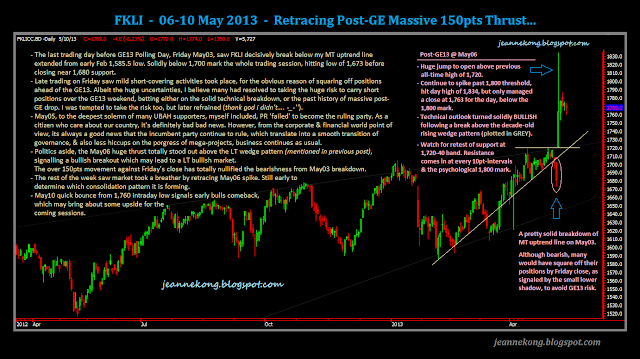 That's to update the past week's movement on FKLI & FCPO.